"We have been storing our caravan with Simon and Roger Stokes for over 20 years. The facilities suit us. The site is secure with high fencing and close circuit cameras. We have used their washing facilities - tall steps, brushes, water and electric is available. The cost is reasonable and most importantly we can access our van at very short notice." "Congratulations EDCS on providing 30yrs of valued service to the holiday caravan community. 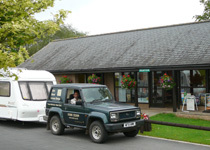 We have received top quality service over the years that we have left our caravan in your care. 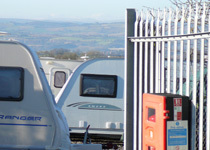 The well maintained storage compound with strong protection security fencing, gives us peace of mind knowing the caravan is being looked after in a very safe environment. The Staff have always been very helpful and careful when moving and towing the caravan to and from the requested caravan parks. Other services such as washing and servicing of the caravan are very useful. Well done and thank you." "We've stored our caravan with EDCS for nearly 17 years. As we don't tow our caravan, we rely on EDCS for towage to and from our caravan park (reasonable towage charge). We've always had a prompt, friendly, reliable and trouble free service. Because EDCS is a gold status CASSOA registered site, our insurance company offers a good premium discount. As a bonus, the EDCS caravan cleaning service is excellent, good value and, for us, avoids that start-of-the-season chore! EDCS is a first class storage facility and we would recommend them to all caravaners seeking storage." "Being caravanners for a good number of years and a 'non tower' from the word go, our caravans have always been looked after by EDCS. Top premises. Top obliging staff. Top service and top facilities... So, if it's storage you're after, with simply no stress, entrust your prized van to EDCS!" "We have stored our caravan with EDCS for over 15 years, during which time we have found Roger, Simon and their staff very friendly, helpful and efficient. The times we have telephoned the office to book a towing service, sometimes at the last moment, our caravan has always been at the required caravan site on arrival. The storage compound is very secure with strong fencing and CCTV system."